For five triumphant years, Manchester’s underground club scene was alight with the deepest of sounds served by four forward thinking DJ-producers collectively known as Development. Though now the club nights cease to exist in their original and regular format, the collective continue to showcase their knack for uncovering musical diamonds via their imprint Development Music – and a truly special one it is. 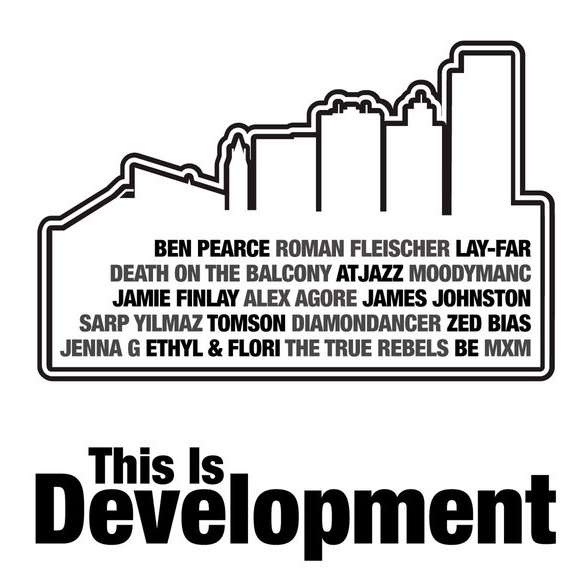 After ten releases of purveying the finest side to the deepest spectrum of house, tech and soul, they’ve collated the best of talent in the culmination of the very strands of their being in a compilation entitled This Is Development. We have the pleasure to delve a little deeper behind the scenes, now is the time to get to know. Firstly, introduce yourselves. Who are the members of Development Music and how did you all meet to form this wonderful imprint? (Did you all pretty much agree on what the label was going to be about? What inspired the formation of the label? Was it party led at the beginning? Were you thinking business or music? Or both? We are Tom Lynch (Tomson), Mike O’Mara, Andy Proctor (Stretford Dogs Club) and Chris Feinmann, four fine looking gents based in Manchester (except for Andy, who’s just moved to Mallorca). We spent years doing parties together, also called Development, up until about 2011 when we brought them to an end. We were exposed to a lot of great producers, performers and people during that time and we really wanted to take what we did in the clubs and try and create that sound on something that would last forever – vinyl. We’ve never thought ‘business’ with music, other than the basic need to generate revenue and deal with the admin associated with it to survive. It’s always been about the luuuurve, man! To let us delve behind the scenes a little, what are the dynamics of how each of you work together? It’s mainly Mike and Tom dealing with things day to day now, wining & dining our distributors/aggregators, buying expensive jewellery for our artists and driving sports cars. In all seriousness, we split the A&R/admin up fairly evenly between the two of us and then Andy and Chris are still heavily involved in the marketing of the releases, talent spotting and generally being the keepers of the status quo for what they helped build up from our parties. What is Development’s mission statement? We did have one once. It’s certainly about creating something memorable, something better than ok. We always look for something different, tracks that stand out from the norm. It’s always about electronic music with soul but that could be techno, house, disco or something slower. How do you feel Development differs from other house labels out there? What do you feel about the “dance” music scene at the moment, and where does Development slot in? We’re never sure that we do slot in very well really. Perhaps that’s a problem or perhaps it makes people notice. We never actively try and do something similar to other labels, that’s for sure. That’s not to say there’s not a LOT of good stuff out there at the moment as house music is as strong as ever, and it all feels connected. The fact that you’ve got proper, credible and underground house music on Radio 1 at tea time says it all, it’s a really exciting resurgence and young people seem to be enjoying it for the right reasons, not just coz it’s trendy. So you’re firmly based in Manchester. In what way/s is our fine city engrained in the very essence of Development? (If at all?) Has being in Manchester had an impact or input in to any aspect of the imprint? We aren’t as rooted in Manchester as we once were J Andy’s now living in Mallorca and Mike’s moved over to Sheffield to Study. We suppose Manchester did have a huge influence on the label, it’s impossible to grow up in such a forward thinking city and not have it shape your tastes. Initially the music we put out was from local(ish) artists but we’ve since managed to put out music from artists in places as far afield as Buenos Aires, Moscow, Berlin and Istanbul. Development was also a successful party. Firstly, why have you stopped putting on parties and secondly, as a bit of an homage, can you name your favourite Development party and why? Yeah it was great while it lasted but most good things come to an end Development was definitely one of those things. We just felt we’d had our time in the sun (5 years) and that we didn’t want to drag it out too much – even though we did come back twice after our ‘last’ party. It’s almost impossible to pick a favourite but we all never stopped listening to the recording of the first time Ron Trent (Prescription) came to play, musically that was very special. How has Development Music evolved since its beginnings? Has anything changed (be it music selection, the way you work, lessons learnt)? Endless lessons. Probably the biggest lesson is that you’re A&R is never as good as you think it is. Something destined for number one might just fall short! But you can’t beat that feeling when you find a track that connects with exactly what you do on a musical level. We just really liked the idea of doing an album. We work with loads of great artists and knew we’d be able to programme an album’s worth of quality music new and old. Because we work with lots of different types of artists and release music at different bpms, it felt like it wouldn’t just be a collection of similar sounding deep house tracks, which let’s face it, would’ve been fairly boring. I assume that you had so many tracks to choose from to be included on the compilation, so how did you go about selecting final tracks? Was it a difficult process? Has this been a long time in the making or was it a more natural, simple process? It was a fairly simple process. There was some older tracks that we knew we wanted to re-release and we were getting sent so many great new tracks that it felt fairly organic. Selecting the mix and ordering it was a different matter though – a carefully thought-out and healthily debated process between all 4 of us. Once finished, what are/were you most pleased with about the album? Absolutely, we’re really happy with it! Really made us realise how lucky we’ve been to put out such fantastic music from so many talented people. This is one of the older tracks that we wanted to re-release as it feels so relavent to what’s going on in house music right now. It’s got a very classic vibe to it, almost garagey but with unmistakable Atjazz sounds and flourishes which set it apart. It’s just got so much soul and energy but it’s so raw and basic at the same time… I never get bored of playing it, salute Atjazz! Mike: Zed Bias feat Jenna G – Let Me Change Your Mind. The first record we ever signed, we we’re sat in Zed’s studio listening to some bits he had available and all fell in love with this straight away. It’s just a great soulful party record that always seems to work! Hearing the track getting played by Mr Scruff on the Essential Mix on Radio 1 is one of the labels highlights for me. A recent signing from Turkish talent Sarp Yilmaz which we were very proud to release. A stunning and deeply soulful beat down vibe featuring the chopped up vocals of a rather famous soul singer. Absolutely loving those deep dusty keys. Perfect for warm-ups, more cultured dance floors and late night mong outs. Great little slow deep house number from young and talented Manchester producer Ben Pearce, been playing a lot of his productions of late on various labels but once we heard this we had to get signed. Absolutely builder of a track that fits perfectly in any warm up or around 5am in the morning. What are your goals for the label? And what’s in store in the coming months, and even years (if you look that far ahead!)? Just to keep going. It’s nice to be able to do something like This Is Development as it feels like a milestone but we’ve not been going very long compared to some other labels who’ve released hundreds/thousands of tracks, so hopefully we’ve got some longevity in us. More immediately, we’ve got a lovely EP from one of our artists called MXM, remixed by Nicholas – that should be out after the summer. Just a thank you to all of the artists for their hard work in submitting tracks for this album, as we’ve really enjoyed working with all of them in different ways.